South Asian culture has long valued the countless benefits of breastfeeding -- for the newborn baby and the new mother -- so why the push for formula on mothers able and willing to breastfeed? Before I had even stepped foot in the labour and delivery ward of a hospital, I was determined to exclusively breastfeed my baby. I had done my research, read the stacks of pregnancy books, and all arrows pointed to the same message: breast milk was the most complete form of nutrition for infants, and its immunity-boosting and maternal benefits were numerous. My decision was supported by the medical professionals and midwives who were involved with my pre- and post-natal care. And, the elders in the home -- parents and in-laws -- encouraged it as well. I expected this; after all, traditional South Asian culture strongly valued breastfeeding, acknowledging its role in mother-child bonding in addition to the nutritional benefits. Of course, motherhood in theory is drastically different from motherhood in practice. Exclusive breastfeeding was a challenge; but, not for the reasons I thought it would be. When, I was faced with bouts of crying scattered throughout the night, my mother pointed at a box of formula that sat on the countertop. "You need to top him up," she said in a matter-of-fact kind-of manner. "But, he's only a few weeks old," I responded defensively, as if I had somehow already failed as a mother. "He's crying because he's hungry and your milk is not filling him," she explained. Those words were echoed again and again by my grandmother and mother-in-law, and other female elders in the family. It left me confused. I had been lucky to have more than enough milk supply, so why did I have to resort to formula? All of a sudden, instead of having an army of supporters, I stood alone waving the breastfeeding flag. And, that was the tough part -- everyone telling me my son was going hungry and the only solution was to top up with formula. Despite my vanishing army, I stood my ground. I nursed around the clock, sometimes as often as every 45 minutes. It was exhausting. But, my determination fuelled me. And, in retrospect, I'm glad I stood my ground. As others in my cohort embark on the journey of motherhood, we share our experiences. In our recent discussions of breastfeeding, I noticed a trend: many second generation Canadian South Asian mothers had an experience very similar to my own. Many of them made attempts to exclusively breastfeed for the first six months as per World Health Organization recommendation, but were encouraged by extended family to supplement feedings within the first few days after birth. "My mother-in-law encouraged me to give up when my daughter didn't latch within the first week. She was convinced that formula-feeding was better, anyways. But, I was determined to keep trying and sought help through a lactation consultant. I am glad I did. I had the joy of nursing my baby for nine months. I would have been devastated to miss out on the experience," Karina*, mother of 22-month-old Riya shares with me over coffee when we first met last year. Her story was slightly reassuring -- I wasn't alone. There were others like me facing a cultural bias when it came to exclusively breastfeeding. One breastfeeding peer support volunteer spoke to a Peel Region Health researcher and recalled, "My mother-in-law, with my first baby... brought a bottle of formula to the hospital." These recounts seem counter-intuitive. South Asian culture has long valued the countless benefits of breastfeeding -- for the newborn baby and the new mother -- so why the push for formula on mothers able and willing to breastfeed? This unexpected shift came as a surprise to me and other South Asian moms. Apparently, we weren't the only ones taken aback by this cultural norm. Peel Region Health took a look at this unusual phenomenon in 2012 as they, too, saw an ethno-cultural factor in the decision to abandon exclusive breastfeeding practices among the South Asian mothers. "For many South Asian families, formula feeding is perceived as the modern, westernized and superior infant feeding method. This view may be more prevalent among newer immigrants, especially those from large urban centres. Early supplementation with infant formula, especially during the first three to five days is commonly practiced." Some would argue that these findings align with the belief that South Asian immigrants deem Western practices to be superior to Eastern ones. "When I mentioned to my mom I wanted to continue breastfeeding past the one year mark, she scoffed at me and said that only people in the ganv [village] do that," Jas*, mother of two baby boys, recalls. Her story, of course, suggested the notion that extended breastfeeding practices are for the uneducated and apparently inferior. That must mean that modern, superior, city-folk choose to bottle feed. Right? It seems that many South Asian immigrants have internalized the formula-feeding messages that were widespread in the 1970s by Western medicine. Unfortunately, they have yet to come up to speed with the research that occurred since then. In 1971, 24 per cent of American mothers breastfed their newborns. Now, that number is nearly 75 per cent. 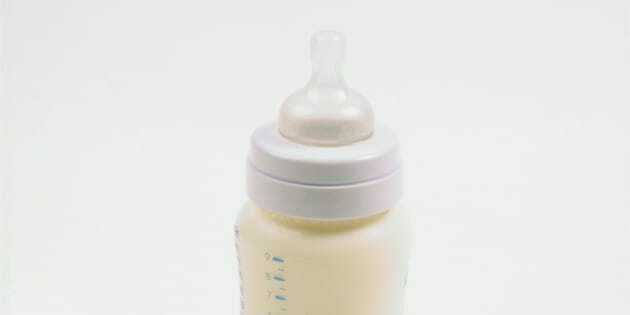 Breast-fed children are more resistant to disease and infection early in life than formula-fed children. Breast-fed children are less likely to contract a number of diseases later in life, including juvenile diabetes, multiple sclerosis, heart disease, and cancer before the age of 15. These relatively new findings are not novel in the Eastern world; they have been a part of traditional South Asian culture for centuries -- long before the advent of modern medicine. Sadly, somewhere along the way, South Asians abandoned their age-old knowledge for the Western, modern, and supposedly superior way to feed newborns. The result? A generation of mothers, like myself, who face these ill-informed cultural biases when they attempt to exclusively breastfeed their children. The first few days, weeks, months are challenging enough as it is. We are all struggling to keep our heads above water, constantly reassuring ourselves that we are doing absolutely everything in our power to ensure our little babies are being given the best possible care. Where modern medicine, long-standing traditional South Asian practices, and extended family should be providing new mothers unwavering support for their decisions, they are planting seeds of doubt and uncertainty in the sleep-deprived minds of mothers. Culturally diverse areas like GTA's Peel Region are determined to make a change. They are implementing programs that combat these exclusive breastfeeding barriers by targeting and engaging mother-in-laws and extended family in postnatal education. The hope is that South Asian immigrants reaccept the benefits of exclusive breastfeeding and embrace it in the same manner as they had in previous generations. *Names have been changed to ensure the protection of privacy of individuals interviewed. August 1 - 7 is World Breastfeeding Week! We want to hear your breastfeeding story. Share your experiences with us by leaving a comment below, or reaching out on Twitter @TheresAnjali and @masalamommas.